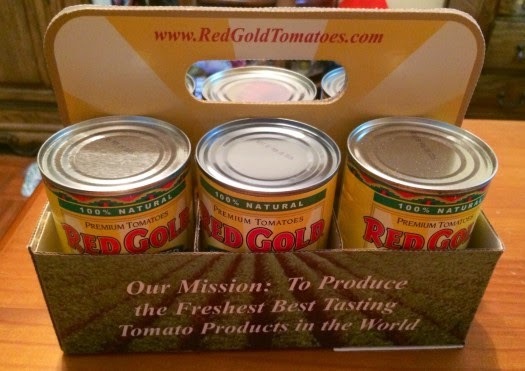 Family-owned Red Gold is again focused on grilling with its Midwest-grown tomatoes this summer, as using tomatoes with ground beef, chicken, turkey or tuna can be a great combination. 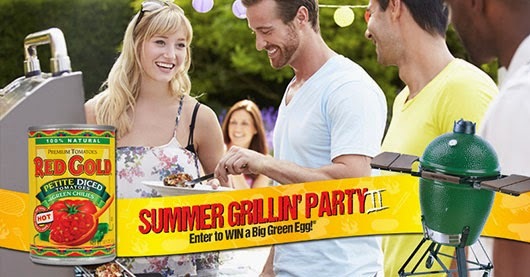 In addition, Red Gold also will be hosting a Red Gold Summer Grillin' Party that begins June 25th on its facebook page. During the promotion, which ends July 23rd, Red Gold will hold a weekly drawing for 1,000 aprons – that’s 4,000 total – in addition to a grand prize of a Big Green Egg Grill and Red Gold Grilling kit. One of the recipes I got in my kit that I thought sounded great for my husband was the Spicy Tomato Burger. We are always cooking out on the grill and he tends to like his burgers with a little more bite than we do. So we opened a can and gave it a try over the weekend. Unfortunately I totally forgot about snapping photos until he'd already eaten both the burgers he made for himself. He used half the size of the recipe below since they were just for him and put half the tomato/green chilies can in the burger and the other half on the burger after cooking it. He said they were great and asked if I had another can! Combine beef & tomatoes (drained). Form into patties. Season. Add cheese to center of each patty for an added kick. Grill. As desired, serve on toasted bun. use Jalapeño Ketchup or Chipotle Mayo. Layer spicy peppers. Win it: One lucky reader will win a Red Gold Summer Grillin' Kit (Red Gold Diced & Green Chilies, Chili Ready, Basil Garlic and Oregano, Lime & Cilantro and Diced Tomatoes, plus a Red Gold apron and recipes). This giveaway will end July 25th at 12:00 AM EST. The winner will have 48 hours to respond to my email. If no response, a new winner will be chosen. Open to residents of the US.